The LilyMini ProtoSnap is a great way to get started learning about creating interactive e-textile circuits before you start sewing. Read on for a description of the board's pre-programmed behaviors and how to snap it apart for use in a project. 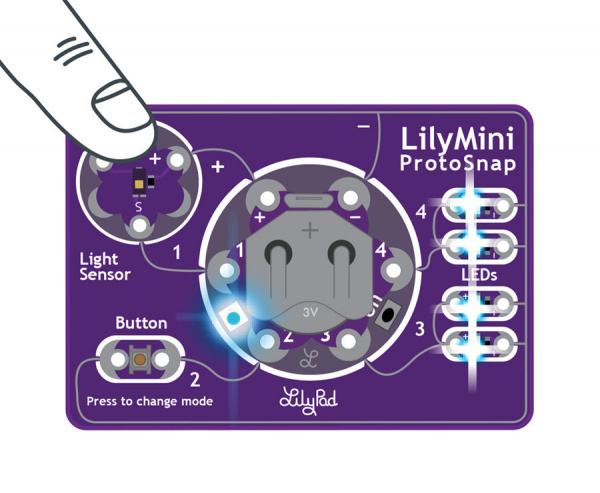 Like other LilyPad ProtoSnap boards, the LilyMini ProtoSnap has all of its pieces wired together, enabling you to test the circuit’s function before you sew. At the center of the board is a pre-programmed LilyMini microcontroller connected to a LilyPad Light Sensor, LilyPad Button, and two pairs of LilyPad LEDs. If this is your first e-textile project, take a look at some of our beginner tutorials. 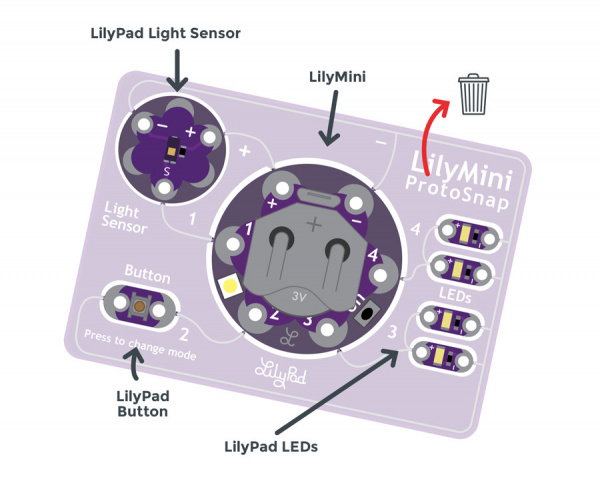 Don’t snap apart your LilyMini ProtoSnap until you are ready to install into a project. Keeping the pieces together is a great way to prototype and test out function before sewing. The LilyMini ProtoSnap includes six LilyPad components connected to a LilyMini by silver pathways called traces. After breaking the ProtoSnap into individual pieces, we will replace these pathways with conductive thread stitch lines. For easy reference, each piece on the ProtoSnap has a nearby label with its name and the LilyMini sew tab to which it is connected. LilyPad Light Sensor (S) 1 LilyMini receives ambient light level input from light sensor. LilyPad Button 2 LilyMini receives button press input to change modes. 2 LilyPad LEDs (+) 3 A pair of LEDs controlled by LilyMini modes. 2 LilyPad LEDs (+) 4 A second pair of LEDs controlled by LilyMini modes. 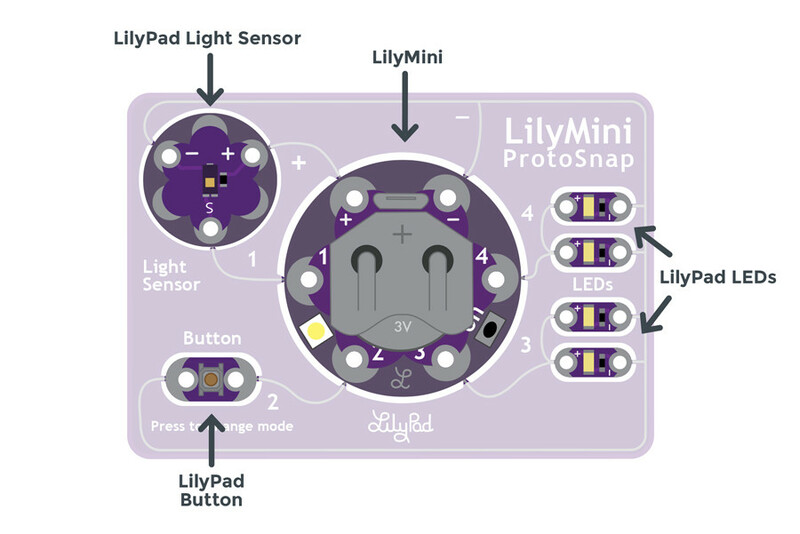 LilyPad Light Sensor (+) + LilyMini provides power to the Light Sensor. All components (-) - All components share a common ground connection back to the LilyMini. 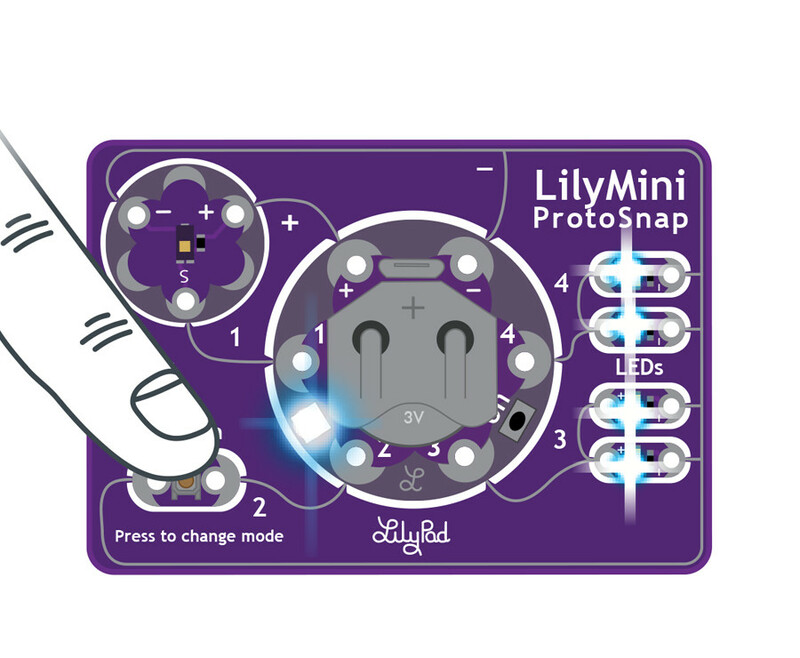 The LilyMini board, at the center of the ProtoSnap, has a built-in battery holder that will hold a 20mm CR2032 Coin Cell Battery. The board can also be powered through the micro USB port. If both are present, the USB cable takes priority. When the LilyMini is being powered via the cable, no power is drawn from the battery. Slide the battery into the LilyMini's battery holder with the + labeled side facing up. Be careful not to break the LilyPad pieces apart while inserting or removing the battery. To remove the battery, use a non-conductive item (pen caps or pencils work well) to gently push the battery out. 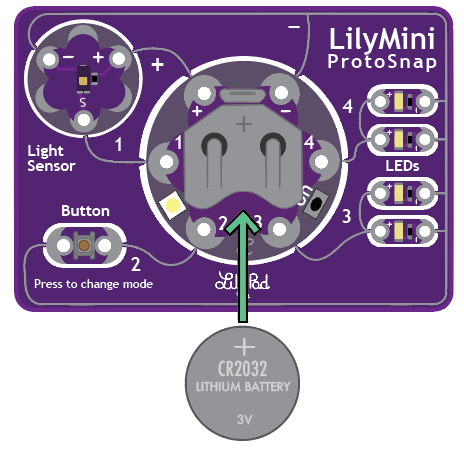 Some LilyMini ProtoSnaps may ship with a battery pull tab, remove this before using. To turn on the LilyMini, locate the small push button labeled ON between sew tabs 3 and 4. With the battery installed (or USB cable connected) press and release the button quickly to start up the LilyMini. To turn the LilyMini off, press the button a second time. A built-in LED between sew tabs 1 and 2 is used as an indicator light when powered on. The LED will briefly flash green upon start up if the battery has enough charge to power the board or flash red if the battery is too low and will not power the circuit. The LilyMini does not include a battery charging circuit, when the LED flashes red we recommend installing a new battery for best performance. The LilyMini ProtoSnap ships with pre-loaded code that uses all the LilyPad pieces connected to it. This sample code has three modes, which can be selected by pressing the LilyPad Button on the bottom-left side of the ProtoSnap (see in the chart below). The built-in LED on the LilyMini will change color to indicate which mode has been selected. 1 White All LEDs on. 2 Magenta LEDs fade in and out in a breathing pattern. When the light sensor is covered, LEDs fade faster. 3 Cyan LEDs off. When the light sensor is covered, LEDs will twinkle. Press the button to switch modes. 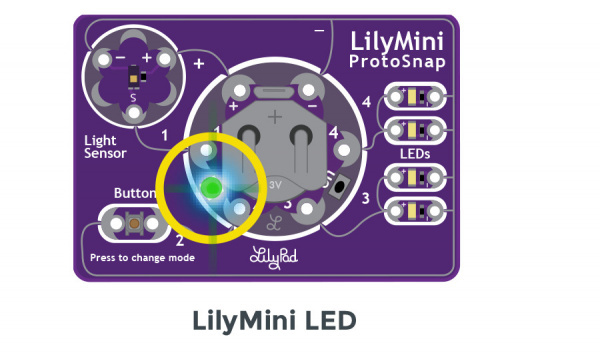 In modes 2 and 3, when the light value from the light sensor falls below a certain level, the LilyMini tells the LEDs to change behavior (breathe or twinkle). When the light level rises again, the LilyMini tells the LEDs to return to the original behavior. Carefully snap the pieces of the ProtoSnap apart to prepare for sewing. Use a set of pliers or diagonal cutters if you are having trouble snapping the pieces apart. Discard the non-sewable pieces and scraps. Before sewing, use a pen cap or other non-metal object to carefully push the battery out of the holder. The LilyMini’s battery fits tightly in the holder. 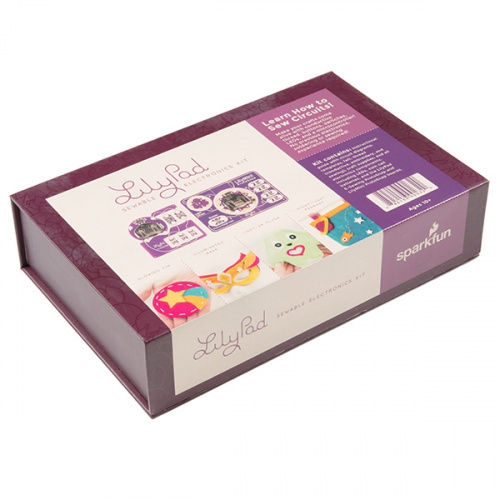 Arrange the LilyPad pieces on your project and secure with a small dab of hot glue or fabric glue, making sure not to cover the holes in the sew tabs. Double check the orientation of the LilyPad pieces against your diagram (or template if using a SparkFun design) before gluing. To help you plan your stitch lines, draw your circuit onto the felt with chalk or a washable marker. 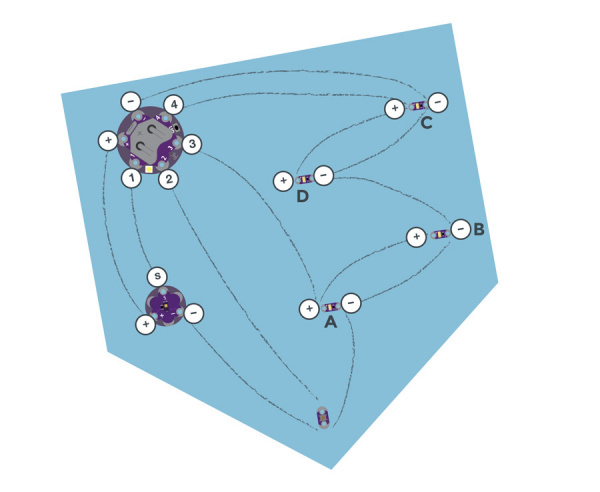 The image above is an example of a project diagram using the LilyMini ProtoSnap. For instructions and downloadable template, visit the Night-Light Pennant tutorial. 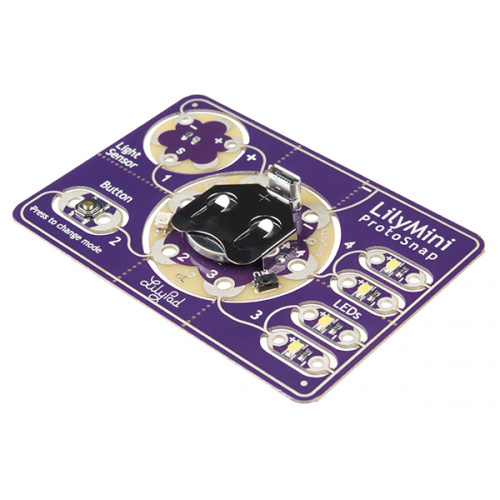 After arranging the circuit, carefully connect each LilyPad component to the LilyMini with conductive thread. Looking for project inspiration? The Night-Light Pennant project from the LilyPad Sewable Electronics Kit uses the LilyMini ProtoSnap.